In the 150th anniversary year of the founding of the Sisters of St Joseph of the Sacred Heart David Schütz, Seán Deany and Josh Martin, began a pilgrimage from Saint Mary of the Cross MacKillop’s birthplace in Fitzroy to her shrine and tomb in North Sydney. 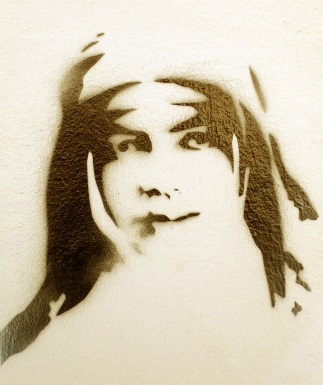 In 2010, Seán Deany approached the Mary MacKillop Penola Centre with an idea for an Australian pilgrimage road “The MacKillop-Woods Way”. The Centre endorsed this idea, from which has since developed the “Aussie Camino” pilgrimage, inaugurated by Seán and Luke Mills in April 2014 and repeated many times since under Luke Mills’ leadership by groups walking from Portland to Penola over seven days. However, Seán’s original vision was much broader: inspired by the Camino de Santiago (which he has walked several times) Seán has mapped out a practical trail leading all the way from Port Augusta to Melbourne (via Adelaide and Penola) to Sydney. In 2012 and 2014 he completed walking and cycling the Port Augusta to Melbourne route. David Schütz, who works for Ecumenical and Interfaith Commission of the Catholic Archdiocese of Melbourne, participated in the inaugural “Aussie Camino” led by Luke Mills in April 2014 and repeated the experience in December 2014 and April 2015. During this time he began to think of the possibility of a walking pilgrimage from St Mary’s birthplace in Fitzroy to her tomb and shrine in North Sydney. So on 28 March (Easter Monday) 2016, David, Seán and Josh embarked upon a new leg of “The MacKillop-Woods Way”. For the sake of practicality, they planned the pilgrimage from Melbourne to Sydney over four sections, intending to walk two weeks every year in the Easter Holidays over the four years from 2016 to 2019. From 28 March to 9 April, 2016, they walked from Melbourne to Bairnsdale in East Gippsland. Six months later October 2016 they returned to Bairnsdale to walk the East Gippsland Rail Trail all the way to Orbost, leaving Bairnsdale on 2 October and arriving in Orbost on 5 October. 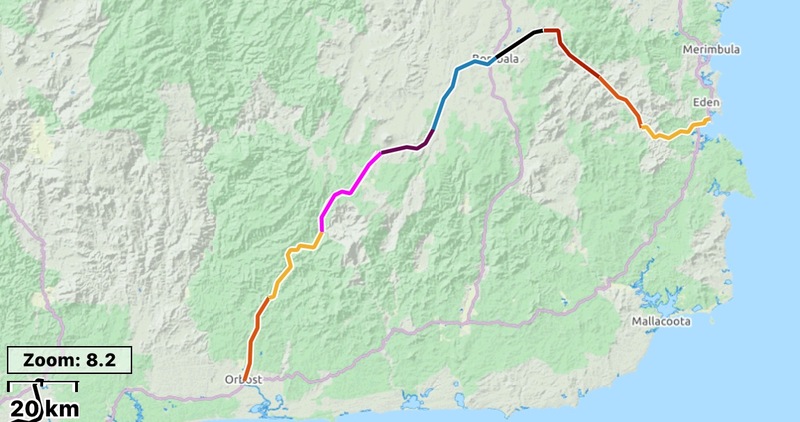 In Easter 2017, David and Seán – with assistance from driver and cyclist Paul Coghlan – left Melbourne on Easter Monday again this time to walk from Orbost (18 April) to Eden (26 April) via Bendoc, Bombala and the Towamba Valley. And in Easter 2018, the three pilgrims, David, Seán and Josh, reunited to work their way up the east coast of New South Wales from Eden (16 April) to Milton/Ulladulla (27 April). On Palm Sunday 2019 they aim to return to Milton to walk to Saint Mary’s shrine, celebrating Easter in Woolongong along the way and arriving in North Sydney two weeks later on Divine Mercy Sunday. The pilgrimage has received the blessing of the Archbishop of Melbourne, Denis Hart, and the endorsement of the Bishop of Sale, Patrick O’Regan, and Archbishop Christopher Prowse of Canberra-Goulburn. The Congregational Leadership of the Sisters of St Joseph in North Sydney and the Mary MacKillop Penola Centre have also both given the endeavour their blessing. As with the “Aussie Camino”, Seán prepared a pilgrim “passport” in which the pilgrims collect stamps from the parishes and towns they visit. 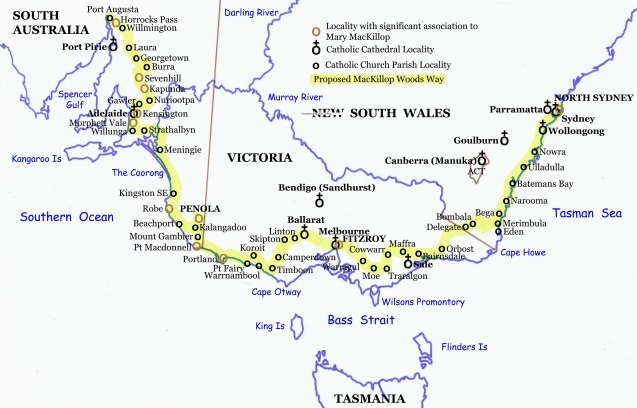 They hope that by pioneering a viable route and walking it themselves, others may follow in their footsteps, and “The MacKillop-Woods Way” from the birthplace of St Mary to her tomb may one day become a recognised Australian pilgrimage trail. Below is a list of links in chronological order of the journal entries on this blog which David Schütz kept each day of the pilgrimage so far. David would very much welcome contact from anyone who would like to learn more about the route they took, their accommodation arrangements and other logistics, should you wish to follow in their footsteps. In 2016, local parishes, including Emerald, Drouin-Warragul, Moe, Traralgon, Cowwarr, Bairnsdale and Orbost, showed their enthusiasm for the idea of “The MacKillop-Woods Way”, by offering accommodation to the three pilgrims along the way. Many other locals, businesses, hotels, cafes and restaurants showed interest and support for the walkers. Sean prepared a “passport” along the lines of the Camino de Santiago credentials for the pilgrims to collect stamps in along the way. For those interested in statistics, the original Google Earth measurement for the entire first leg of the MacKillop-Woods Way pilgrimage from Fitzroy to Bairnsdale was 320km. David’s realtime GPS measurement came in at 366kms. So let’s call it a round 340kms! 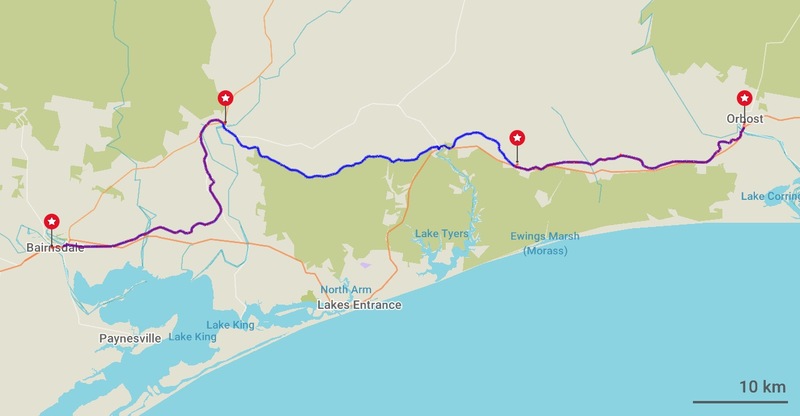 The logistics of the second leg (Bairnsdale to Eden) were difficult, so Seán, Josh and I decided to complete the “easy bit”, 100km along the East Gippsland Rail Trail from Bairnsdale to Orbost over four days from 2 to 5 October 2016, staying at Bairnsdale, Bruthen, Nowa Nowa, Tostaree and Orbost, which would make the next section (Orbost to Eden via Bombala) more manageable next Easter. I had a better app to measure my distances on this section, and so can confidently state that the distance from Bairnsdale to Orbost is just over 100km, my app measuring 103.5km. At the end of this section we had covered 443.5km. MacKillop-Woods Way Pilgrimage 2016 II: On the Way again! The 2017 leg of the MacKillop-Woods Way Pilgrimage from Orbost to Eden via Bombala. The different colours each indicate a day’s walk. On Easter Monday, 17 April 2017, Seán and I, in the company of our friend Paul Coghlan, set off for another leg of our pilgrimage . Unfortunately, Josh was not be able to join us for this leg. Paul was our driver and backup as we were heading into remote territory. He was also getting ready for a cycling tour through Italy from Sicily to Lake Como, and cycled this section of the pilgrimage in preparation. We walked for nine days (approximately 250kms) as we travelled from Orbost in Victoria, to Goongerah, Bendoc, into New South Wales to Craigie, Bombala, Towamba and finally arrived at Eden on the NSW coast on 26 April. 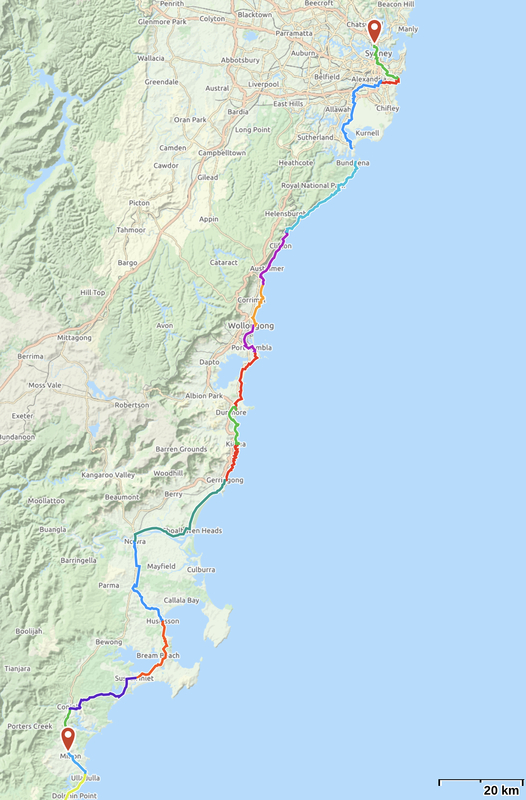 The entire leg was just on 250km, making the distance covered so far 693km, well over half way to Sydney (which is estimated at another 525km). So, Sean, Josh and I returned by train to Eden on 16 April, 2018 – two weeks after Easter this year to fit in with the Tasmanian school holidays for Josh, but still around our usual “pilgrimage season”. We enjoyed 11 days of perfect weather, only getting rain on our last day. This was a tough section – unsupported with a backup vehicle, and with no rail trails to ease our way. All that was more than made up for this time, however, by the great amount of help and assistance we received from the people, parish secretaries and priests of the parishes along the way. Our special thanks go to the Parishes of Eden/Pambula, Tathra/Bermagui, Narooma, Moruya/Batemans Bay, and Ulladulla Milton, and specifically to our hosts, Mike and Judy Sheppard, Fr Luke Verrell, Colleen and John Manns, Margaret Latimer, and Eileen Hogg. Most of this section was in the Canberra-Goulburn Archdiocese, whose Archbishop, Chris Prowse, has been very supportive. We’d also like to thank John McLaurin, editor of the Canberra Catholic Voice, for lots of publicity. We entered into the Diocese of Woolongong in the last couple of days. Sean, Josh and I are heading off on Palm Sunday 2019 for the final leg of our journey on foot from St Mary MacKillop’s birthplace to her tomb. It has been three years since we started from Brunswick Street, Fitzroy, on 28 March 2016. We have walked over 1000km since then, via Bairnsdale, Orbost, Bombala, Eden, Narooma, Batemans Bay and Ulladulla.